Artanis, our newest StarCraft warrior hero, is now available to players that pre-purchased StarCraft II: Legacy of the Void. Read on for a brief overview of this hero’s abilities. 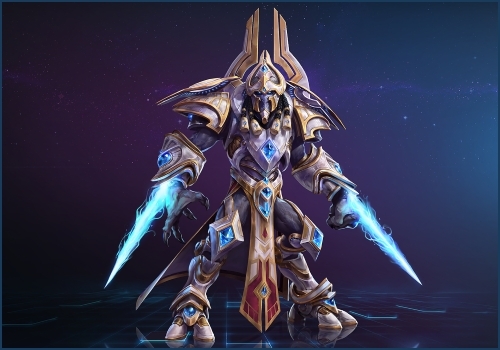 Artanis will be available for purchase from the in-game Shop for all players starting on Tuesday, October 27. If you take damage while below 50% Health, gain a Shield for 5 seconds. Your Basic Attacks lower the cooldown of Shield Overload by 4 seconds. Dash forward to deal damage to enemies, then return to deal significantly more damage. Your next Basic Attack immediately strikes the enemy twice. Fire a Phase Prism that deals damage to a Hero and swaps your position with theirs. Target an enemy with an orbital beam from the Spear of Adun, dealing damage every second for 8 seconds. The beam will chase the target as they move. Unlimited range. Fire a large area pulse from the Spear of Adun, dealing damage and Blinding enemies for 4 seconds. Unlimited range. Players failing to select a Hero in Hero League draft lobbies will no longer be granted a random Hero. Instead, the AFK player will now receive leaver penalties and the game lobby will disband, placing all remaining players back at the queue screen. NOTE: Players who pre-select a Hero but do not lock in will not be punished under this new system. Using that time to communicate with your team is expected. Players will be locked in with their selected hero, if it is still available, once their selection timer runs out. The time allotted to select your hero in Hero League and Team League draft lobbies has been increased from 30 to 45 seconds. Maximum queue time has been increased from 360 to 600 seconds. Queue times have been improved for new players. Nazeebo’s Corpse Spiders and Zombie Wall Abilities will now deal damage to Immortals on the Battlefield of Eternity battleground.